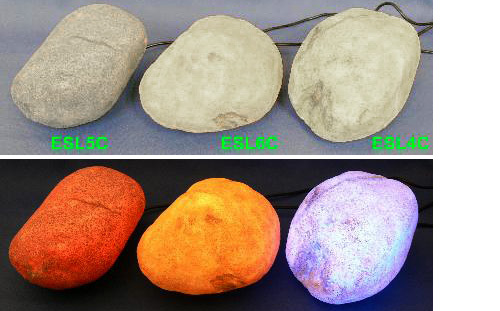 Color Changing LED Garden Stones | OhGizmo! By Andrew Liszewski on 09/11/07 • Leave a comment! Outdoor speakers ‘cleverly’ disguised as fake stones are nothing new but this is the first time I’ve seen garden lights disguised that way. When powered off these unique stones look like your run-of-the-mill chunk of granite but when turned on a set of color changing red, blue and green LEDs inside cause the entire stone to glow like it just plummeted to Earth from the deepest reaches of space. The stones are completely waterproof and will even float if for some reason you always thought your pool or pond could benefit from glowing, floating rocks. A 33 foot submersible cord also allows you to place the rocks all around your backyard while still being able to power them on and off from a single location. The stones are currently available in 3 different ‘designs’ for $34.95 a piece.